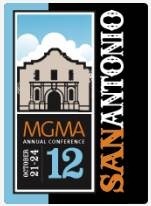 I mentioned last week that I was hoping to find a way to attend MGMA. In a stroke of good luck for me, one of our revenue cycle staff had a situation crop up that prevented her attendance, so I promptly agreed to fill in for her. I actually enjoy dealing with practice management and revenue cycle issues and knowing more about those topics has been helpful in my work as a CMIO. Not to mention, I like San Antonio and needed a warm getaway after several weeks of chilly rainy weather in my hometown. Today featured a variety of specialty-specific preconference activities as well as the exhibit hall, which held a “tailgate party” event with food and drink served in the aisles which made it fun and casual (although I’m sure the booth staffers wish they could have shared in the drinks part). My favorite booth of the day was VaxServe, which was giving out free flu shots to willing takers. As the industry consolidates, there are so many people moving around. I saw several vendor reps who are now with different companies than they were with just a few months ago at HIMSS. There’s quite a focus on ICD-10 and lots of people in the booths asking pointed questions about when vendors will be ready. There are some good panels and education sessions scheduled and I hope to attend as many as possible. Hopefully I will run into Inga and catch some sponsor get-togethers as well. Be sure to follow us on Twitter @IngaHIStalk and @JayneHIStalkMD for the play by play. 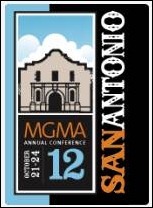 What do you think about MGMA this year? E-mail me.